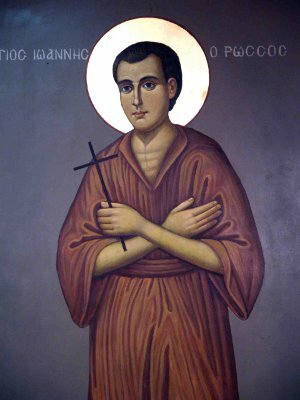 On the 27th of May we celebrate the memory of a newly-revealed Saint, of Russian background, whose holy remains are found to be – seemingly against human logic – incorrupt and whole, close to 270 years after his bodily death, at the town of New Prokopi (formerly Emin Agha) in Evia Greece. We are referring to the Venerable John (Ivan) the Russian, the New Confessor. Among the soldiers of the Russian Tsar Peter the so-called Great, who fought against the Turks in 1711 in that unfortunate war for the Russians during which Peter himself almost got killed, was also a young handsome lad called Ivan. Ivan was about 20 years of age who came from the region known as Little Russia. An innocent and simple peasant boy, he had been brought up with orthodox piety, the piety that transformed a vast and untamed barbaric land and made it “Holy Russia“. It seems that apart from Church books and texts Ivan was not educated. He knew, though, very well how to distinguish between good and evil, between temporary and eternal, and between that which was according to God and according to the world. He knew that the meaning, taste and beauty of life is Jesus Christ. He also knew that by being with Him (Christ) and close to Him you are blessed and fortunate, regardless of any thing that may befall you in this life, whatever the magnitude and size of temptations that may come upon you! Therefore from a young age he had cast his anchor to God and lived according to His holy will; humbly, quietly, without hollow egotism and affinity to the worldly and vain things. His breathing consisted of “Gospode Iisouse Christe, Sinye Bogou, pomiloui mne” (i.e. “Lord Jesus Christ, Son of God have mercy on me”). 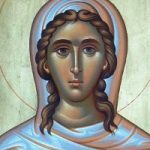 His greatest joy was the Divine Liturgy, and his enjoyment was to practice never ending prostrations and veneration before the icon of the most sweet “Bogoroditsa”, the Theotokos (Mother of God). For pleasure he had fasting, asceticism, and hardship. 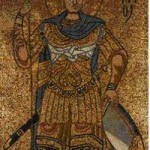 His hope and goal was the “Tsarstvo” of heaven, the Kingdom of God! However, God does not put aside a “flower strewn life” on earth for His elect. On the contrary, in the world He promises them sadness, distress, hardship and temptations, because narrow is the gate that leads to Life and upward and difficult is the way which leads to salvation. The Christian life is not one of ease and comfort and enjoyment, but a cross! 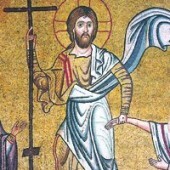 Likewise for the pious Ivan he kept a cross. In the Russo-Turkish war to which we have already referred to, the Tatars who fought with the Turks took Ivan prisoner and sold him as a slave to a Turkish official from Prokopi in Asia Minor. How can anyone describe the life of slavery? Can one describe the humiliation, the insults, the put downs, the reproaches, the beatings and tyranny? If one also takes into account that Prokopi was the camp of the Genitsari who were “double the sons of hell” even of the Turks, then can one understand the tortures of the Christian lad! If that wasn’t enough, he had also the extreme pressure put on him to change his faith, to confess the “salavat”, to have the “sounet” performed on him, thus turning him into a Muslim! Pressures, at times gentle and at times violent! Sometimes with promises and sometimes with threats! You see, Satan has many ways and methods up his sleeve. However, they had fallen on a “hard nut”, so to speak, or rather onto a hard rock that had become harder because of its constant contact with the Precious Stone, the Cornerstone, which is Jesus Christ! Therefore his reply was always, both to the promises and to the threats, a firm “niet” i.e. no! All this sounds strange to the ears of those who look at things in a secular worldly way, but all this was the result of slavery! The young Ivan was free within his slavery. Free from all kinds of ties with passions and sin. He was internally free, in his soul, in the depths of his heart, because freedom is not something of the body but principally a matter of the inner man! You could be free in the body, but a prisoner of corruption, of sin! You could also be a slave like Ivan but inside feel the fullness of the freedom that the presence of Christ grants. 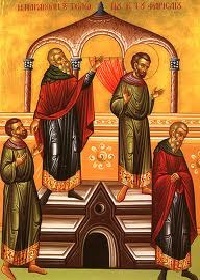 In this way the young Russian obeyed his master “in the Lord” (Eph. 6: 5-8 and Col. 3: 22-24), rendering “Caesar’s things to Caesar”, and refused obedience on the subject of faith, rendering “God’s things to God” (Acts 5:29). We can therefore say that Ivan’s position and his coping with slavery is for us a proposal for life in freedom. Ivan’s example shows us the manner in which a human being becomes and is truly free. We, who as subordinates and employees, protest and grumble at every order given us by our superiors. We constantly wait for the time we will become masters so as to take revenge on others who become our subordinates. We who occasionally obey something and consider it a humiliation; we who as children consider our parent’s advice as “oppression”; we who have been spoken of as “the neck of a Greek does not carry a yoke”; and we who within the depths of our soul have the remains of a four hundred year slavery, a more recent triple occupation and a few dictatorships to boot, have much to learn from lvan’s stance and the manner in which he confronted slavery. The Saint was not a fatalist. He did not say, “slaughter me Agha that I may become a saint”. He knew what was happening to him, and he also knew the reality of things. He knew that it was up to him if he wanted to be enslaved or to remain free. If he gave up his soul and became a Muslim the Turks would let him free. They would give him plenty of “bakshish”, wealth, money, honour, and glory! However, he also knew that he would then be a true slave! Slave of self-love, love of life and of egotism! If he refused to give his soul, even if he physically remained a slave (as it came to be) or even lost his life, he would be free (as he was). The obedience which he practised to the various tasks set to him and the obedience to the will of his master (of course that which did not conflict with Christ and His holy will), was in essence, according to the aforementioned presuppositions, an act of freedom! Moreover, is was a voluntary offering, and a sacrifice of his own will (such as that practised by monks, who give up their will to their Geronda (spiritual Elder), and obey him in the Holy Spirit). “Slaves obey your earthly masters with deep respect and fear. Serve them sincerely as you would serve Christ. Work hard, but not just to please your masters when they are watching, but as Slaves of Christ, do the will of God with all your heart. Work with enthusiasm, as though you were working for the Lord rather than for people. Remember that the Lord will reward each one of us for the good we do, whether we are slaves or free” ( Eph. 6:5-8 NLT). Truly the way he approached this, was as though the sweat he poured out for his master was as sweat poured out on behalf of Christ. The work of his slavery was seen as work done on behalf of the Gospel! In this way, all this brought abundant divine Grace on this servant of God, and the young slave received the charisma of working miracles! His master and other Turks, seeing the miracles worked by Christ through Ivan, started to treat him with much respect and honour and asked him to accept his own separate quarters equipped with all amenities. He politely declined and continued to live in his stable until the day he gave up his soul to the Freedom- and Life-giver Christ on the 27th May 1730 at the approximate age of forty years. This was soon after receiving the All-holy Mysteries. Ivan was first buried at the humble little church of St. George, near the estate of his master, where he usually went to pray throughout the night. From there, in 1845, the Christians translated his relics, which had remained incorrupt, to the large church of St. Basil that had been built during that time. He remained there until 1924, working miracles on both Christians and Turks. 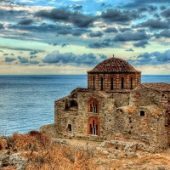 At the exchange of populations in 1924, the people of Prokopi, forced to move to mainland Greece, brought his relics – such a precious treasure – with them to Evia where they settled at Emin Agha, which was renamed New Prokopi. 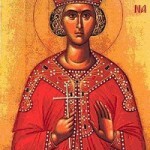 At the initiative of the late and of blessed memory Bishop of the region, Gregory the Metropolitan of Chalkida, the piety of the people built a grand and beautiful church in memory and honour of the sweet smelling rose of “Holy Russia”. 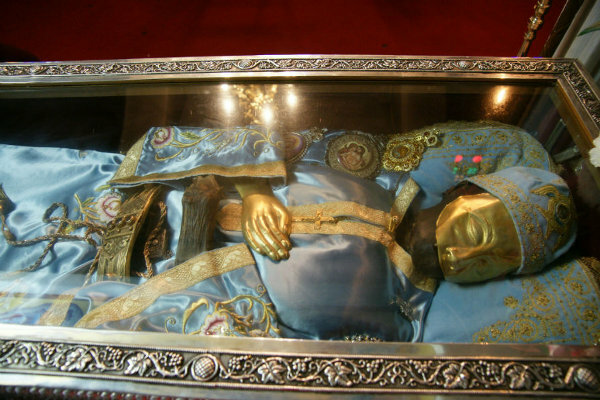 There at last rest his Holy Relics that are venerated by thousands of people throughout the year and produce streams of miracles and healing of all kinds “to those who approach with faith”. The Venerable Ivan shows a special love for children through the many miracles bestowed upon them by Christ. 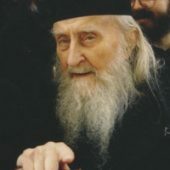 With visible intervention, many times he saved children from certain death during earthquakes when roofs fell on to children during school hours at Prokopi and in Athens at the Holy Umercenaries (Aghi Anargyri) some years ago. He also saved countless children from terrible diseases and other calamities. Even his help and benefaction to adults is not limited! Whole streams of miracles have been bestowed upon them as well! Deaf and dumb are able to hear and speak! Paralysed are able to walk in good health! Blind see again! Cardiopathics return to their former strength! Cancer sufferers are healed! A certain woman from Cyprus bent over due to a spinal problem so that her head reached her knees, like the one in the Gospel, was healed a few years ago immediately she donned the belt of the Saint. This miracle was made known widely by the Press. 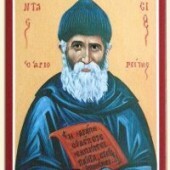 A non-believer physician (who at one time, with great disrespect, had called the relics of the Saint a “mummy”), was healed from an incurable and terminal illness when the humble Saint appeared to him and said, “I am he whom you called the ‘mummy’, and I heal you by the Grace of my Lord Jesus Christ”! Demoniacs are freed from the demons that possess them! Saddened people are comforted! Disillusioned people find hope! Weakened people are supported! Disbelievers become believers! Pious people are strengthened in their piety! The name of God is constantly glorified because of the small-framed slave boy from Russia. 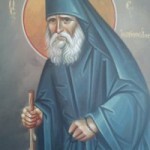 This was the suffering stable-hand who lived as a slave without slavery, voluntarily poor, unimportant, dressed in ragged clothing, obedient, but firm though in his holy Orthodox Christian Faith, having the “Slava tebie Bozhie” (Glory to you God) constantly coming from his mouth! God is glorified, and he also abundantly glorifies his creation, who love in gloriousness and humility. God glorifies his genuine child, who “through the words of his lips stayed firm on tough paths” (Psalm 16(17):4). God glorifies His Confessor who was not embarrassed or afraid to confess Him “before all people” and now God confesses him before all people, before the Angels and Archangels, all the Saints and the Bogoroditsa (Theotokos), before all creation visible and invisible!